To describe this couple, it would be appropriate to use the clichés “food is love” and “recipe for romance”, because they really do apply. Mohamed Al Bitar and Sarah Khanna have been married for almost seven years now and are best known for their show Hakawy El Mashawy on CBC Sofra. Their hassle-free attitude to love and life is refreshing, and what makes their story so interesting is the fact that it revolves around something we can all appreciate, good food. 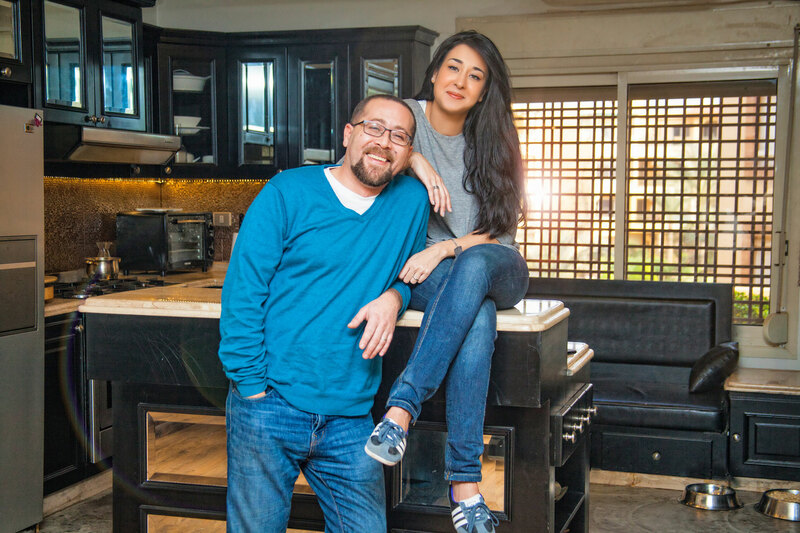 eniGma’s Lina Ashour discovers how this couple found success in love and in the kitchen. How did you guys get into cooking? Sarah: I was working in advertising and I realised it was a waste of my life. Then when I got married in 2007, and Mohamed and I moved to Malaysia, I became really interested in cooking. I felt I needed to document my progress so I started a blog called Buttered Up. I also took a course in cooking to develop my skills. When I got back to Egypt I held a number of jobs including recipe development, restaurant consultancy, menu revamping and becoming a food writer. Then we got the offer to do Hakawy El Mashawy and we took it. Mohamed: I started cooking first and got her into it. When we got engaged I was living alone and had two kids that I had to feed on the weekend so I started cooking and reading books about it. She started helping me out and we realised she knew way more than we expected. I was already working in television at the time when I was offered the position of producer and manager for a children’s channel in Malaysia. When we returned we began the show on CBC Sofra. What effect did the move to Malaysia have on your marriage? Mohamed: I think one of the things that made our marriage stronger was that we went abroad immediately after our marriage. The first year of marriage is one of the hardest ever. Being alone in a foreign country, you have no alternative but to deal with each other and sort out your problems. So how did food influence your relationship? Mohamed: I was the guinea pig for all the recipes in her blog. And when we were alone in Malaysia she started waiting for me to come home so we could cook together and it became like a couple activity. Sarah started getting into food science and ultimately we were influencing each other’s taste in food. We also started watching all the food channels together. Every single recipe on Hakawy El Mashawy has been a bridge between us. Sarah: We still go to the supermarket together, till this day. After you guys started cooking professionally, were you still cooking together at home? Sarah: I was really into it until TV happened. Cooking for the masses, you get a lot of criticism. For example you get phone calls from people saying “you’re not supposed to be putting fruit in a salad,” so that put me off a little from cooking at home but it had the opposite effect on Mohamed. He took this as motivation to continue doing what we were doing. He started doing more in the kitchen as a result. We recently managed to get back to that balance where we’re cooking together again. If he’s at work for example, I’ll do the prep work and continue when he gets back. That’s why we end up having dinner at around 10 pm. It seems like your love for food had a positive influence on you guys as a couple. Sarah: It did, but in the beginning I had a problem because if you’re going to come into the kitchen, you have to clean up after yourself, which he didn’t do. Once he started doing that though it was smooth sailing. So it did strengthen us as a couple because we’re a bit antisocial and cooking gave us a good chance to spend time together. It’s part of the reason we prefer having people over for dinner rather than going out. Valentine’s Day is just around the corner, what do you guys do for gifts? Sarah: Commercially, a lot of emotional pressure is placed on buying gifts for occasions like Valentine’s Day. Mohamed buys me flowers randomly as opposed to just on Valentine’s Day, which makes it more special for me. But birthdays for example, are important and you should get something nice for the other person. When it comes to our anniversary on the other hand, we found that it did not make sense to buy each other something. So we started buying one gift for both of us and we’d split the cost. First thing we started with was the coffee machine. What are some of your favourite things about each other? Sarah: I’m very temperamental and he absorbs whatever mood I’m in and throws it back at me in the appropriate way. He can turn my sadness into something positive. I also think the most important thing is not to lie to each other from the beginning. Being human is being flawed and I think the most important things we have are compromise and honesty. Any marriage should have a lot of both. Mohamed: I love that Sarah gets me without talking. We’re both very moody and the clashes are a lot less because of that whole understanding thing. And I have flaws like everyone else but she never tried to change that. It’s not a marriage as much as it is a friendship that grew into something bigger. It would be an oversimplification to say that Mohamed and Sarah are all about the food, but it does mean a lot to them. They know how important it is to have that kind of bond in a relationship. At the end of the day, the best advice they could offer couples is having a lot of understanding. Without any pretence and through their love for the little things in life, we know Mohamed and Sarah have an even more incredible journey ahead of them.